You know that the animals in your life are there for a reason. They have a purpose. They are spiritual teachers, healers, angels and guides. When you learn to recognize, respect and revere them for who they truly are… you become a better human fulfilling your purpose here. AND, they get to fulfill their purpose too. No one is immune to making mistakes. It happens to the best of us — a parent, an entrepreneur, a celebrity — it happens to all of us at one time or another. Animal lovers often give very little thought to this mistake until it’s too late. Part of my purpose is to help you avoid making this critical, sometimes deadly mistake with your pet. You simply can’t afford to repeat the mistakes of the past. But it won’t happen to you if you know how to avoid these costly mistakes. So what are these 7 deadly mistakes? And how can you sidestep it on your way to enjoying a loving, healthy, happy relationship with your animal every day for the rest of their (and your) life? Do you see the pattern here? Does any of this resonate with you? You can learn how to avoid these mistakes by learning how to communicate. Like all relationships, crystal communication is THE #1 KEY to enjoying a happy, healthy pet in your life. My purpose is to help you transform the DREAM of communicating with animals into REALITY. For the next 6 5 days you can get GREAT deals on all of my Home Study Courses. If you’ve had your eye on them for a while, now is the time to SAVE, big time! I hear from students every day telling me how wonderful they are… how profound the difference is in their lives… how magical their relationship with animals is becoming. The Holiday Sale includes all my BEST animal communication and intuitive development courses. Just choose what you want and use the HOHOHO25 Coupon to get your 25% off! Get your basics down with a solid foundation you can build upon, learn important animal caretaking skills AND have a lot of fun too. Start now for as little as $72! Already got your basics down? Then it’s time to begin mastering your skills by applying them to all 12 situational areas! Be prepared when your animal gets sick, behaves badly, performs poorly, and know how to help with rescues, fosters and with all stages of life. Advance your skills now for as little as $72! Gain more clarity, boost your confidence, get unstuck with your pets while you have fun developing your intuition! Regularly $97. In just 90 minutes, you can begin developing your own intuition and it’s only $57! 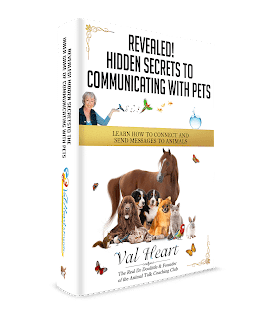 EVERY animal talk student needs to know how to facilitate a successful conversation with any animal, what to do when you get stuck, which are the right questions to ask and what NOT to ask if you want to get results. Regularly $97, you can learn to master the ART of the conversation with animals for only $57! This Season isn’t usually jolly for pets! Animals react poorly to change, stress and instability all of which are typically inherent with Holidays. Fortunately there are many wonderful ways to help them stay sane, healthy and safe. NOW is when you need to know these things – Learn how for only $20! Many animals (and people) end their life during the Holidays, more than at any other time of the year. Do you know how to help them? How to recognize their pain and suffering? Do you feel confident and peaceful about helping them with lifestyle management changes, or in making the compassionate decision to euthanize? Once they’ve passed on, do you know how to reconnect with them in the Afterlife? If you answered No to ANY of these questions, then you NEED this course. It’s not just for dogs. The principles apply to ALL animals. Get it now for only $72! IMPORTANT: Because my accountant is fussing at me for making such steepyear end discounts on these wonderful, life changing courses, this offer is only valid now through Friday Dec 27th. Ready – Set – Go! The clock starts now. You’ve got 6 days left before this sale is history. Your animal’s life, health, happiness depends on your ability to understand their messages to you, every day. 3) Enjoy your 25% off! Following these guidelines, as well as working with my veterinarian on wellness care, including comprehensive regular wellness exams, will help me give my pet a better and probably longer life. Thanks!